Military-style weapons are smuggled in huge numbers from the United States civilian market to criminal organizations in Mexico and other Latin American countries. These weapons enable transnational organizations to wage brutal wars for the control of lucrative criminal trade through the Western Hemisphere. These violent criminals commit murder, kidnapping, and extortion, and traffic in everything from drugs to human beings. New semiautomatic assault weapons are trafficked across the border from the United States because it is the easiest and cheapest place in the world to purchase them, thanks to weak gun laws and a deliberate strategy by the U.S. gun industry to design and sell military-style weapons to civilians. 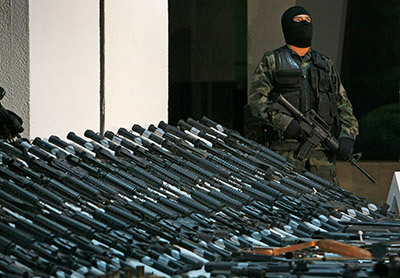 The government of Mexico recovered and submitted more than 99,000 firearms to the U.S. Bureau of Alcohol, Tobacco, Firearms and Explosives (ATF) for tracing in the years 2007 to 2011. Of those, the vast majority — more than 68,000 — were sourced to the United States. The VPC’s Cross-Border Gun Trafficking project is an ongoing analysis of the types of firearms illegally trafficked from the United States to Mexico and other Latin American and Caribbean countries. Utilizing indictments and other documents filed in U.S. courts primarily in the southwest United States that detail the make, model, caliber, manufacturer, and retail source of firearms seized in criminal trafficking cases, this website reveals that military-style semiautomatic firearms easily available on the U.S. civilian gun market comprise a significant portion of the illegally trafficked weapons.